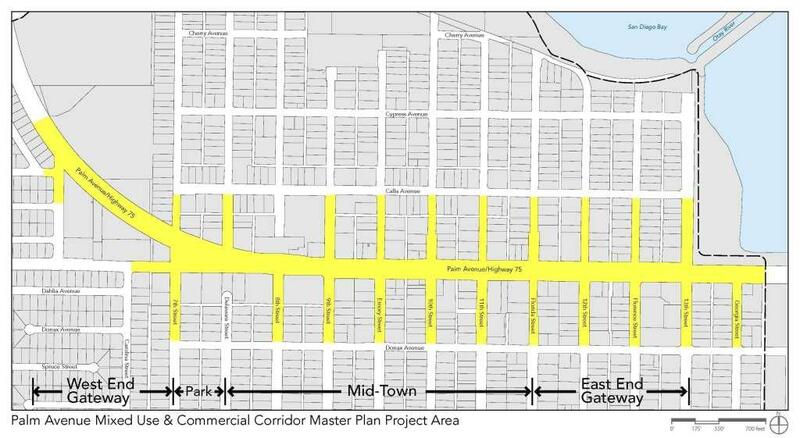 The City of Imperial Beach has completed the design phase of the Palm Avenue Mixed-Use & Commercial Corridor Master Plan and has circulated a Mitigated Negative Declaration (MND) for public review. You are invited to attend an upcoming Public Review Meeting to comment on the Draft Mitigated Negative Declaration (MND) which assesses and analyzes environmental impacts of the proposed Master Plan. The Draft MND, which identifies environmental impacts including traffic and circulation, was circulated for public review on April 16, 2015. This will provide an opportunity to comment on the results of the MND. If you have any any questions regarding this information, the Draft MND or the Master Plan itself, please contact Greg Wade at (619) 628-1354 or at gwade@imperialbeachca.gov. The City welcomes and encourages your participation!! Click the link below to sign up for community involvement opportunities and project updates. To provide your input and comments, email us at PalmMasterPlan@imperialbeachca.gov. Members of the community are encouraged to attend to hear about and provide input on this exciting project!